Jira is now available for Re:amaze! Jira is Atlassian’s popular project and issue tracking platform designed for technical support teams to collaborate and work faster. The official announcement is on our feature update blog and you can read it here: http://blog.reamaze.com/2018/07/05/new-reamaze-app-jira/. 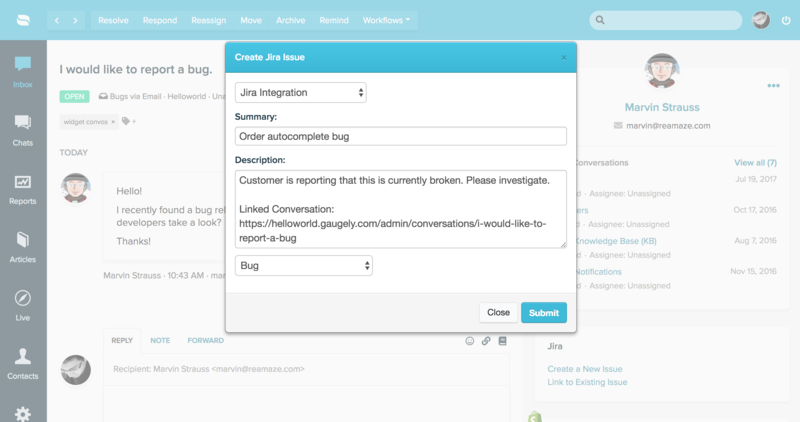 Issue tracking – allows teams to record and follow the progress of every problem or “issue” that users identify until the problem is resolved. Agile project management – an iterative approach to planning and guiding project processes. Customizable workflows and integrated solution – integrates with popular apps so you can work in sync. In a customer service context, Jira allows your support and technical support teams to easily obtain customer feedback and create new issues in Jira so your entire team has visibility into the feedback provided. You can also link to existing issues. Great customer service is deeply rooted in your ability to not only answer questions efficiently but to follow up with answers after something has been fixed or built for the customer. The Re:amaze Jira integration allows you to seamlessly talk to customers, track customer issues, update issues, and report back to customers all in one view.